After being a lover of MAC foundation since I was 17, realising that my budget for makeup would be made hugely smaller as a student this year has forced to me to switch to a cheaper alternative. I did a lot, and I mean a lot of research to find a cheaper alternative to MAC’s high end products. I was desperate to find a foundation that was pretty much the same; I wasn’t expecting anything exact as I believe you get what you pay for when it comes to foundation, but I hated the thought of going back to the products I used to use. So, I googled a ‘drugstore’ alternative to MAC’s Studio Fix Fluid, and many people recommended Revlon’s Colorstay Foundation. 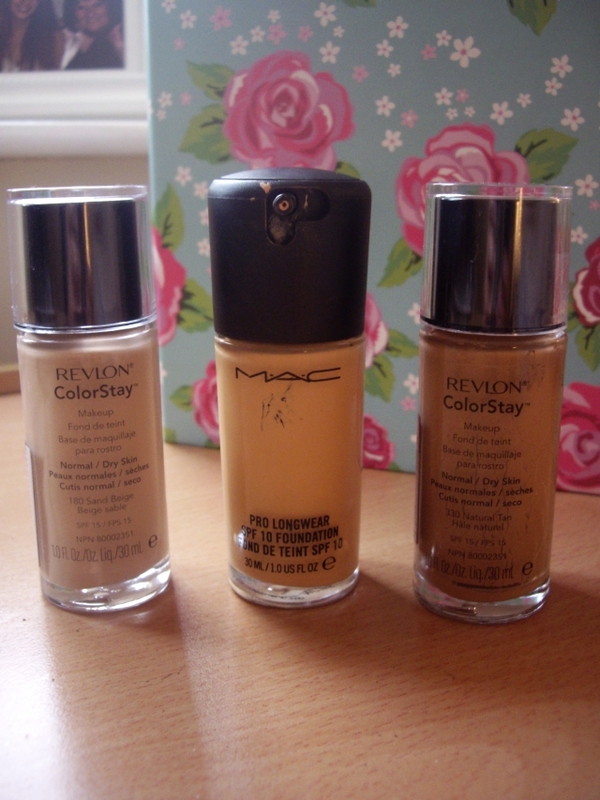 When I went to buy it, I had no idea what colour to pick, as there wasn’t as wide a range of colours comparable to MAC’s. I picked up two – 180 Sand Beige and 330 Natural Tan. 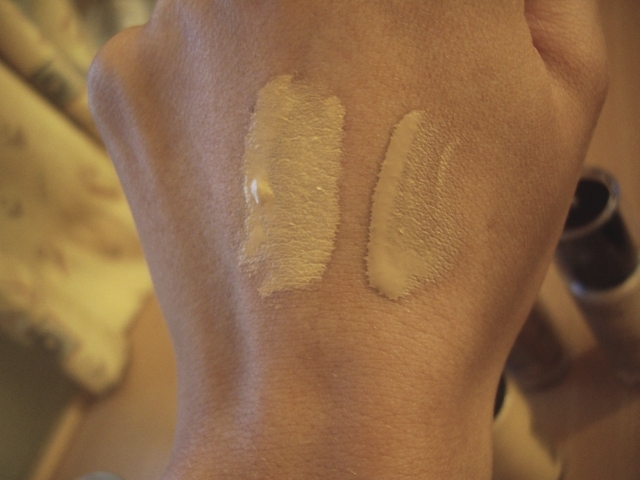 Yes, two completely different colours, one being considerably lighter than the other, but they had the yellowy tones that MAC is known for having in their foundations which I like. I decided I would buy both, and mix the two together, while it was still summer and I had a nice tan! The next puzzle for me was deciding whether to choose the Combination/Oily or Normal/Dry version. Considering I have combination skin and suffer from spots, I immediately thought the first one. But then I realised the problem I had with a purchase a few weeks before of MAC’s Pro Longwear SPF 10 Foundation. I wanted a foundation that wouldn’t slide off my face during the summer if I sweated it off, so I wanted to try Pro Longwear to see whether it would last the 15 hours it claims. It ended up sucking in all the moisture I had on my face, making it patchy and dry. So, I knew that buying the Normal/Dry version of Revlon’s would be a better idea. As soon as I got home, I mixed them together to create a really nice shade that matched well with my tan. As I was applying it, I noticed it didn’t have the strong ‘paint’ smell that MAC foundations have. It did have a thinner consistency, so I needed to apply more than I would usually, but looking in the mirror my skin was flawless, and I definitely didn’t expect that. Throughout the day, I did have to top up my foundation where it had rubbed off, but not as much as I thought. After that day, I knew this would be the foundation I would use for the next few years. The consistency of the foundation keeps my face moisturised without feeling oily, as I didn’t break out when I started using it. It gives my skin a dewy look, but not to the extent of looking shiny or greasy. And, as a bonus, it has SP15 just like MAC’s Studio Fix Fluid, which is good for keeping my face protected from the sun every day! MAC’s Pro Longwear SPF10 Foundation has recently creeped back into my foundation routine as a top up for areas on my face that always tend to rub off. I’ve found that it agrees with my skin in the winter for some reason, and doesn’t manage to dry my skin. I don’t have to touch it up at all the days that I apply it. So I’m finally getting my money’s worth!